Learning how to use a Brayer is well worth the effort, when you see some of the things that can be achieved with this small piece of equipment. 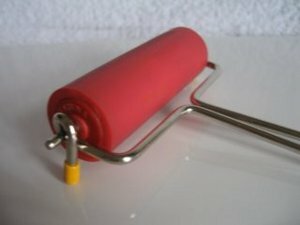 This small piece of equipment is a hand held roller, generally used in print making. They are used to spread ink, paints, dyes or stamping inks around, and are now widely used in creating beautiful scenes for cardmaking. They can produce some really spectacular results but they do need some practise before you master the technique.... and I'm ashamed to say that I haven't mastered one ... yet! The roller can be removed from the handle for other items to be added .... such as rubber bands, that will give the most unusual finishes to your card. Papers can be made to look like wood, leather or fabric. If you are really interested in learning how to use this piece of equipment, and want to learn from one of the best then pay a visit to Clarity Stamp for some great tips and tutorials. Barbara even has her own CDs on sale so that you can learn the techinques in your own time, but following along with her, as she teaches you what to do. I openly admit I am not that clever with one... but I have created some Patterned Paper and shown you how I did it. But practise makes perfect so I will keep practising!! They can be made from rubber, sponge or acrylic and the one you use will depend on the result you wish to achieve. The recommended one by Clarity Stamp is the Speedball Brayer which is a softer rubber for some specatcular results. Rubber rollers are ideal for creating backgrounds, while sponge ones are the choice for stencilling. You can...if you are skillful enough...carve your own pattern to create some unusual designs on your papers to make them truly unique. Take a look at the easy to create paper and have a go at it your self. Experiment and play around to see what you can create.